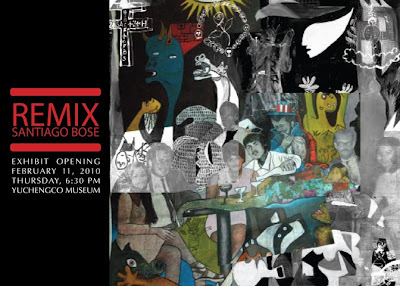 The Yuchengco Museum and the Santiago Bose estate opened the exhibit Remix: Santiago Bose on February 11, Thursday, 6:30 p.m. Remix: Santiago Bose, the museum’s first major show for 2010, is a postmodern retrospective on the late, internationally acclaimed Baguio visual artist and cultural provocateur. Seven years after Santiago Bose’s unexpected death in 2002, contemporary artists continue to create in the wake of his ideas, forms, and ideology across various media. Remix: Santiago Bose explores the late artist’s roots through his self-portraits, and contextualizes his impact on Philippine art through modern takes of his research by more than 50 visual, literary, and multimedia artists. Remix: Santiago Bose runs until March 31. The Yuchengco Museum is at RCBC Plaza, corner Ayala and Sen. Gil J. Puyat Avenues, Makati City. Museum hours are Monday to Saturday, 10 a.m. to 6 p.m. To RSVP and for more information, call 889-1234 or e-mail info@yuchengcomuseum.org.